Well, folks, we have reached that point in the season where almost everyone is good, most of the time! And yet, it is still a roller coaster. Such is the magic of Carson Daly. We begin our night with Paxton Ingram, who never imagined he would be in this position. Honestly, I never imagined he would be in this position either, but the past few weeks, our charismatic duckling has been molting into a musical swan before our very eyes. He will be singing Whitney Houston’s “I Wanna Dance with Somebody (Who Loves Me),” because “there’s something about just recreating female powerhouse vocals,” but the twist is that he’s going to “change it up” with an “acoustic vibe.” It is an inspired arrangement, I think. I am particularly fond of the enthusiastic rainstick player vigorously rainsticking in the background. “It was the most rejoiceful version of that song I’ve ever heard,” raves Christina. Speaking of Christina, what item of clothing is she wearing, I wonder? I have been thinking about it for a long time now and I am no closer to an answer. Big news! Pink will be joining The Voice next week as a special guest advisor! To pump you up, Carson Daly will now show a fraction of her brand-new music video for “Just Like Fire.” I did not find it very fire-like, but I enjoyed it nonetheless. Mary Sarah is doing “My Church” by Maren Morris, because it is “a mixture of traditional and country music,” just like Mary Sarah herself. Her plan is to accompany herself on the guitar, but Blake, for one, does not love this idea. “Soldiers want to see you move around,” he drawls, grossly. “Trust me. I’ve witnessed it.” What I love about Blake is that he never misses an opportunity. He is right, though, is the thing: All the judges agree it is her best performance yet, except Christina the sea witch, who has no comment on the matter. After his brush with death last week, former professional dancer Nick Hagelin is feeling more confident than ever, so he’s singing Drake’s “Hold On, We’re Going Home.” Is it a prophecy, do you think? The judges mostly focus on his professional dancing, which they uniformly agree was excellent. “I thought it was actually really cool when you were dancing,” observes dance critic Adam. As for the rest of the performance, I would say that Nick Hagelin seems very, very nice. I would also say that I admire his penchant for tunics. I hope they make a comeback. Until The Voice, Hannah Huston was singing once or twice a year in coffee shops, and now look at her! She is belting out Jessie Ware’s “Say You Love Me” while standing on a giant wood-paneled triangle surrounded by billowing towers of smoke. It is a soulful, wrenching performance with lots of artful growling, and just when you think it can’t get any more heartfelt, she is joined by a chorus of ninjas in turtlenecks. “That was my personal favorite performance by you this entire season!” gushes Blake. “You were able to soar on those high notes,” agrees Christina, “but you also were vulnerable and tender in the parts that mattered the most.” If I am being honest, I was somewhat distracted by the a cappella ninjas, but I will take Christina’s word for it. Then Carson Daly decides it’s time for break, so he brings out reigning country champs Florida Georgia Line to sing “H.O.L.Y.” I would suggest that this song is somewhat repetitive, but the thing about The Voice is that there’s something for everyone. In the audience, America sways blissfully and at random. Teen idol Shalyah Fearing is taking on Sam Cooke’s “A Change Is Gonna Come.” “I feel like I have big shoes to fill,” says Shalyah, nervously listing people that have sung this song before her. “There’s a lot of pressure.” And yet she brings it, as she always does; she is a tremendous performer, our Shalyah. It feels at times like she is imitating someone else, someone older and more famous, but I think it is important to remember here that Shalyah is 16. “She’s 16,” confirms Adam. “How is that not SO impressive?” In keeping with the general theme of the night, Blake declares it her best performance of the season. Determined to show America that he’s more than just a roaring guitar hero, Laith Al-Saadi veers into uncharted waters with an intimate piano performance of “We’ve Got Tonight” by Bob Seger. Oh, my friends, this one tugs at the heartstrings! It is tender and lovely and pure. In the audience, Laith’s girlfriend gently weeps; watching her, so do I. “When you started, your voice filled this room,” notes Adam, cleansed. “Everybody stopped. You could here a pin drop. And to me, that’s the ultimate sign of respect. It was so beautiful.” I like to think it was cathartic for all of us. Now it is time for the moment we have all been waiting for: Blake Shelton and Gwen Stefani take the stage for their debut performance of “Go Ahead and Break My Heart.” Frankly, the intensity of their chemistry makes me deeply uncomfortable, but I am willing to concede that this is just prudishness on my part. To cool things down a little, season-nine winner Jordan Smith sings a song about the Olympics. I find it very reassuring. Next up! Adam Wakefield is singing “Love Has No Pride” by Bonnie Raitt, and he has a clear vision for it, which Blake says is the true sign of an artist. Unfortunately, the set designers also have a clear vision, and it is a vision of the apocalypse. It is a mournful performance, and a soulful one. Behind him, the projected city burns. Why does it burn? That is something we can wonder together. “That was fiery,” coos Christina. “What you did right there? Your best performance so far!” cheers Blake, who is truly enjoying his evening. 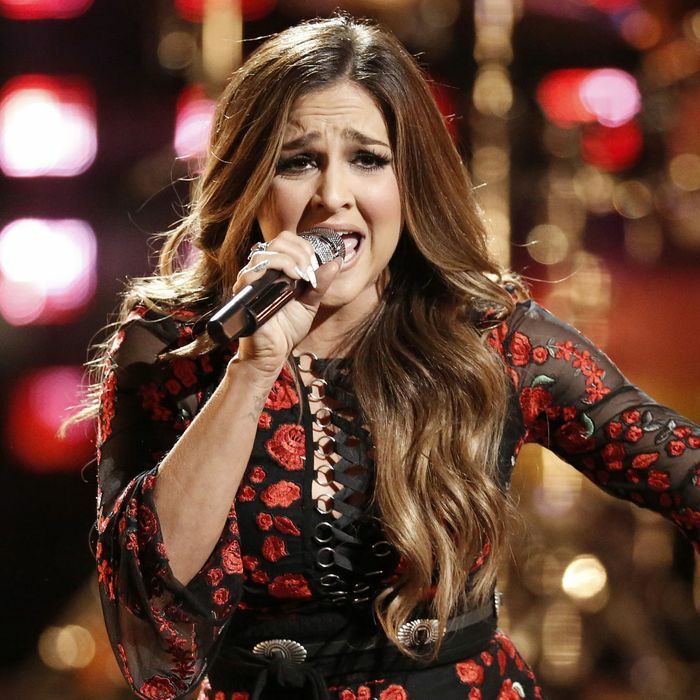 I am now going to say something radical: I did not love Alisan Porter’s performance tonight. She does “Cryin’” by Aerosmith, and despite its raging passion, I would say I only liked it. I know. I am as shocked as you are. Still, it would be hard to argue that she is not a rock star. “You kill that misconception that moms can’t do this or moms can’t do that,” muses Pharrell, appreciatively. “You were a superstar just now!” beams Christina. Adam also wanted to talk, but he was silenced by the sands of time. What would he have said, do you think? The coveted last spot of the evening goes to my one and only, Bryan Bautista, who’s singing classic math anthem “1+1,” by Beyoncé. “This song is very romantic, and I want him to bring the passion for this one,” says Christina. I do not care for this song, but oh, what passion he brings! Truly, it is everything I have been waiting for from Bryan, and more. It is strong. It is sensual. “Man, that was really beautiful,” says Adam, praising the effortlessness of his high notes. “That was just mind-blowing,” says Christina. “Beyoncé, if you’re watching out there, you’ve got to do a duet with Bryan!” The hashtag is #brianbeyonce. I trust you are doing your part. And there you have it! In your estimation, who deserves to go home? Also, how do you feel about tunics?